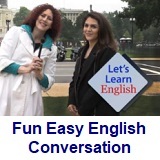 ﻿ Fun Easy English - new classroom free online classes english language lessons speaking listening writing reading january 4. 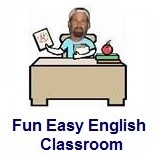 Today in the Fun Easy English classroom you will think about why you are studying English. A basic knowledge of English has become a requirement in a number of fields, occupations, and professions. 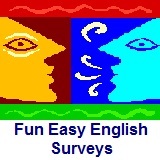 Although many people learn English for their careers, still many learn English for other reasons. Why are you studying English? Hi. In the classroom today you will learn a few facts about the English language. Approximately 375 million people speak English as their first language. Including second language English speakers, the total number of English speakers ranges from 500 million to over one billion people depending on the level of the speaker. India has the largest number of English as a Second Language speakers. Following India is the People's Republic of China. Modern English is the main international language in communications, science, business, aviation, entertainment, radio, and diplomacy. A basic knowledge of English has become a requirement in a number of fields, occupations, and professions. Although many people learn English for their careers, still many learn English for other reasons. From YOUR Teacher: Why am I studying English? Even though I am a native English speaker with a standard American English accent, I continue to study different aspects of the English language. English teaching is my career and it is important to know as much as possible in order to be an effective teacher. I especially like to study English accents from different regions throughout the world. I think English pronunciation and accent reduction is most important for English language students. Understanding idioms and slang are also important and fun to learn. I am also a language student and in the past studied Hebrew, French, Spanish, and now Japanese. In the future I am hoping to find time to study Hindi, Chinese, Arabic, and Korean. Maybe even a few others. Language study is fascinating and a great way to meet new people. Survey: Why are you studying English? English is the most studied language in the world. Everyone has different reasons for studying English. Conversation Lesson 4 - What Is It?